Need a to-do list to track progress? Try using a checklist to keep track of task details! Looking for big-picture plan progress? 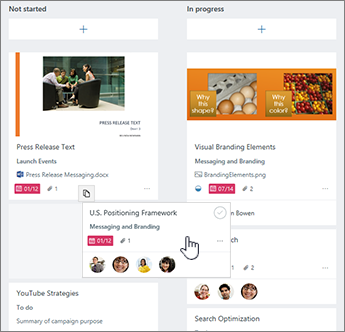 The Charts view provides overall progress of all tasks in your plan, so you can see how things are going. To quickly mark one of your tasks as Completed, point to it and select the check mark. Using a touch screen? If you're not using a mouse, you won't see the check box to mark something as completed. Instead, check out a few other ways to update progress. Tip: Completed tasks are hidden at the bottom of the task list. Scroll down and choose Show completed. 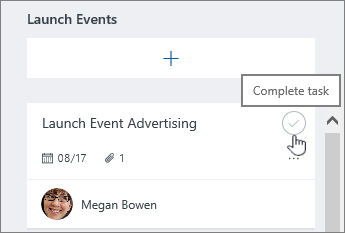 and then drag tasks between columns to quickly update your plan on the fly. 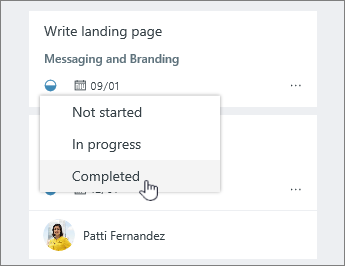 For tasks that are already marked as In progress, you can also change status by selecting the In progress symbol on the task and choosing another status. 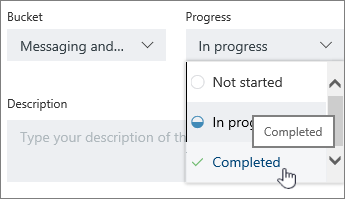 You can also update task progress by selecting the task itself and using the Progress drop-down box.